Timothy Snyder on what the 20th century tells us about Trump’s endgame. 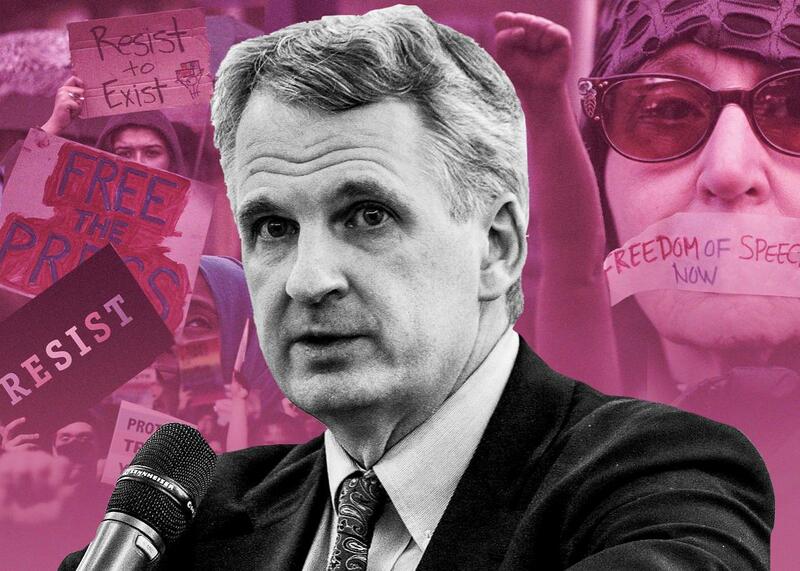 Timothy Snyder on the president’s endgame and how effectively Americans are resisting so far. Photo illustration by Natalie Matthews-Ramo. Photos by Spencer Platt/Getty Images, Kena Betancur/AFP/Getty Images, Frauemacht/Wikipedia, David McNew/Getty Images, and David McNew/Getty Images. I spoke with Snyder by phone last week to discuss the book and to get his opinion on the first several weeks of resistance to President Trump. During our conversation, which has been edited and condensed for clarity, we discussed why the concept of an “end” to history is so dangerous, the ways in which the opposition to Trump has surpassed expectations, and the autocratic ruler Trump most resembles. Isaac Chotiner: What specific lessons does the 20th century teach us about fighting tyranny? Timothy Snyder: The 20th century is special because it’s really not so distant. People who lived in the 1920s and ’30s and ’40s were not so different from us. In some ways, they were probably better citizens than we are. They had longer attention spans, for example. Educated people tended to read a bit more than we did. Because we declared that history was over in 1989, we have as a society deliberately chosen to break the connections with those experiences and to break the connections with the thinkers who grew out of those experiences, people like Havel and Arendt, who I try to resuscitate in these pages. The 20th century shows that the form of government that we take for granted, a constitutional democratic republic with checks and balances and a rule of law—that form of government is usually temporary. The 20th century gives examples of how that particular kind of regime can be changed into another. The book is about those examples of regime change and about how they might be resisted. It was a big mistake for us to declare an end to history. Not just because it’s my line of work, but because when we did that we were deceiving ourselves about what had happened. What had happened was one story, the story of communism, the teleology of communism had turned out not to be true. The conclusion we should have drawn was, Well, those kinds of grand narratives are not true. The conclusion that we drew instead was our grand narrative is true. It’s just true that capitalism or globalization leads to enlightenment and prosperity and democracy. Therefore, we can fold our hands. I think we got it exactly wrong. I think that explains, to a great extent, why we are where we are now. It means that we’ve been complacent about watching authoritarianism return elsewhere, and it means we’ve been surprised that authoritarianism is possible here. Of course it is, and of course it always was. It does feel, ironically, that that complacency has now pretty firmly laid to rest any idea of American exceptionalism. Yeah. I’m not an American exceptionalist. I’m from this country. I love this country. I identify very strongly with this country. But it’s hard to be an American exceptionalist when you devote most of your energy and your thought to other places, because you just can’t help but see patterns and connections that maybe Americans don’t see which are utterly present. I think part of what’s happened is that trends that were already present in places like Russia and Ukraine, mainly what we’re calling alternative facts or post-truth, have traveled from east to west. Part of American exceptionalism is to think, Well, we’re different from everyone else. It’s always been our great ideas that radiate outward. We don’t have to worry about things coming back to us. We think, OK, maybe this globalization starts somewhere around Wichita, Kansas, and spreads outward to the rest of the world. Globalization also can come back toward you. Interestingly, a number of the people I know, probably you do too, who predicted that Trump would win were precisely Russians and Ukrainians who found the political style familiar and just asked, “Well, why couldn’t it work there?” They were the ones who turned out to be right. Some Indian friends of mine who had witnessed Modi’s victory were much less surprised by Trump, but for people like myself, who grew up almost entirely post-1989—I am younger than you—found him unfathomable. You’re younger than me, but you’re not as young as my students. … The kids now who literally can’t remember anyone being president except Obama have a very limited sense of what the problems of a republic might be. What I worry about is people will fall from this politics of inevitability into what in the book I call the politics of eternity, where you go from thinking Oh, everything has to go well” to OK, it turns out everything has to go badly. Then we miss the real lesson. The real lesson of ’89 is the lesson of any year, which is that history has structure but also has possibility. It’s officially critical moments like this [when] people have to take responsibility for what the future is going to be like. Along those lines, what do you make of Steve Bannon’s belief that history goes in cycles? I think it’s intellectually interesting. My book makes comparisons to the ’30s. I’m assuming that it’s a negative framework. As far as I can make out from Mr. Bannon, it’s actually a positive example [to him]. What he has in mind for America now is a kind of alternative 1930s where we go back and we have the chaos and we have the disruption, but we don’t have the social welfare state and we don’t have the anti-fascism. In other words, I think what he has in mind is a kind of 1930s without Roosevelt. The fact that America First seems to be a slogan of this administration confirms that. America First is precisely about an alternative United States where it’s Lindbergh rather than Roosevelt who is the central figure. Turning to the present, what have you made of the resistance that we’ve seen in the first two months to Trump? I wrote the 20 lessons in November. … With the resistance, I guess there are two ways it’s been better than Germany in the ’30s, which is kind of my benchmark. That’s a pretty depressing benchmark, Tim, but OK.
Yeah. I try not to overestimate us, right? One is that people recognize faster that if you stigmatize one group you’re going after the whole system. A lot of people, and some of them do but most do not, recognize that the Muslim ban is not really about Muslims but about changing the way politics works as a whole. That’s on the positive side. Also on the positive side so far are the lawyers. I don’t mean all the lawyers. I don’t mean Kellyanne Conway. I don’t mean Jeff Sessions, both of whom seem to have violated professional ethics pretty drastically. I do mean the lawyers who had got out in front already in November, December, and started to think about what the necessary lawsuits might be and then were ready to file in January and February. The reason I think of the lawyers is that, like Germany in the ’20s and ’30s, we pride ourselves on being a rule-of-law state. You can’t undo a rule-of-law state without lawyers. In the Nazi example, most of the lawyers switched over. In fact, a lot of the lawyers were right at the forefront of some of the most atrocious policies of that regime. In the book, you expressed skepticism about us being online all the time, and what that means for democracy. But a lot of the instant activism and the response to the travel ban was online. The speed at which everything moves now makes it necessary. Have you changed your opinion at all? It’s not a blanket fatwa on the internet. What I’m calling for is a certain amount of awareness. The internet as such did get us to where we are. I think Americans just are more poorly educated in civics now than they were 20 years ago. I think it’s also the case that your average American day-to-day is more likely to believe all kinds of stuff which is just not true, because of an industry making us believe that which is not true, which was much harder in the days of print. I think we have to be really watchful about that. Although it sounds old-fashioned and naïve, I think we have to really start caring about the truth. That said, if the purpose of social media is to get physical people out on the streets, then yes. I say this quite explicitly in the book: What happens online only matters to authorities in so far as it leads to actual protests and actual interaction of real people. That’s a practical test, two practical tests. Is the stuff that you’re doing online favoring truth? The second step: If it’s activism online, does it end in the streets? Those are two ways to check what you’re doing. Are there things, either in terms of the way the Trump administration has behaved or in terms of the way people have failed to respond, that have made you think things are worse than you thought? I guess the main thing would be media normalization. On the one hand, the New York Times and the Washington Post have been sharp for the most part. They seem to recognize what the stakes are. What I find interesting about them and about a bunch of other outlets is that people call them the mainstream, but they’re totally not the mainstream anymore. They are actually now quite edgy. The whole idea that you have a print outlet, and you have reporters, and so on is pretty edgy these days. Of course, CNN speaks in many voices. Fox does too for that matter, but in general, people who work in television media have a hard time getting out of the daily cycle and therefore their tendency is very strongly to normalize. To imagine that whatever happened today is somehow OK. That, I think, probably has to change. It’s not just a matter of individual reporters at CNN or even Fox challenging the president. That’s important, of course. It’s more a matter of being able to think not just about today, because once you think about today, then you don’t have the distance to know that things are truly weird or truly unusual, and you’ll tend to distance. You’ll see moments on television where something very strange happens, but they just normalize. That’s probably the thing that worries me the most. You mean over-responding to the president’s joint address to Congress, or something similar? Yeah. That’s a terrific example. There’s no reason to think that any word that comes out of his mouth signifies anything in particular. Everybody in the press knows that by now after two years of covering him. The idea that because he reads a script, that has some significance, or that you would call him presidential, or speak of a pivot, that’s just grotesque and surreal and not a journalist’s job. The other thing which is kind of good news and bad news has to do with how a branch of government reacts. Homeland Security and Border Patrol seem to be pretty uncritical about directives coming down and seem to be obeying in advance and interpreting the guidelines broadly, which is exactly what you’re not supposed to do. That would be bad news. Not all branches of government are behaving that way. How important is it, in stopping an autocrat, to have people in his own movement or party resist him? In order for this to be stopped, there has to be unconventional activism. Americans have to do the kind of things they haven’t been used to doing because the system that we’re used to is now precisely in question. The Democrats also have to resist. That’s a necessary but not a sufficient condition. There has to be the conventional resistance. Then some elements of the Trump electorate have to shift. Maybe not most of it, but some of it has to realize that OK, this wasn’t just a symbolic moment. We may actually be losing the Constitution, which I think a number of folks who voted for Trump would actually care about. I think a certain amount of the Republican Party, more than does now, has to care. I think all those things have to happen. If we wait for the Republicans on their own, that’s never going to happen. It has to be as a result of a whole lot of other things happening around the Republican Party. Does Trump remind you of anyone from recent history, or does he seem sui generis as a possible tyrant? Viktor Yanukovych, the former president of Ukraine who was a client of Russia. Yanukovych’s main idea in power was to turn the Ukrainian state into a money-making machine for the Yanukovych family. I think whatever ideological coloration we think actually applies to Trump, we can be pretty confident that he sees the American state as a mechanism to make sure that people called Trump are rich forever. That might include or require a turn towards some kind of radical right, which in one mode can be a distraction to what’s really going on, which is the family kleptocracy, or in another mode can be required because if you deliberately favor inequality and do away with the welfare state, that tends to move politics toward the radical right. He kind of reminds me of a Yanukovych who has people skills: Someone who never really succeeded until he got control of the state, and once he got control of the state really could be wealthy. Because that’s the way he sees the world, he then looks at Russia and says, “Oh yeah, Russia is normal,” because saying Russia is normal or Russia is an example is a way of saying, “There aren’t really laws. There aren’t really rules. That’s all just a sham.” That’s really morally and politically comfortable if what you’re fundamentally out to do is to enrich yourself.